I'm sleeping on the inside. Back in the Pleistocene Era of our marriage when there was plenty of time and energy to devote to the planning and execution of Valentine’s Day, we devoted time and energy to Valentine’s Day. “And I need you to go to the grocery.” I obliged, begrudgingly and sweetly. I have my paycheck on direct deposit with Publix, which is a huge time saver. I think I said something like “shut your yabber gabber” before I pledged my love and hung up the phone. And, I was there on time, along with a full parking lot of middle age parental lovers anxious for tomorrow’s Valentine’s throw down. I rolled past one Volvo blaring premature Barry White. Of course, Coach Stopwatch ended pratice late, which made my mad dash to the grocery all for naught. If I had known I had an extra ten minutes I would have cherished my stroll down aisles ten and two looking for taco seasoning and tortilla chips. I take my alone time when I gets it. After dinner Alyson and I played seventeen rounds of Rock, Paper, Napalm to see who won the prize of driving one of our offspring (who shall remain nameless) back to our vacation home to purchase a card and box of candy for their special valentine. Alyson won. I was the gracious loser. Maybe fate will shine upon me tomorrow and I will go to the grocery THREE times! Ahh tomorrow…that special day of romance and devotion. Ellie Kate has a doctor’s appointment at two o’clock, and Jake is getting a cavity filled at two-forty. Then its track and play practice for both, a frozen pizza dinner and homework somehow, and decorating for Ellie Kate’s birthday, which is Wednesday. Thank God Grace Ann moved out last year to art school…its the nicest thing she has ever done for Alyson and me. But at least Aly and I will be able to go out and have dinner with each other tomorrow night, stealing a few moments amidst the craziness. Good idea anyway. We waited too late to make reservations. Fleur De Lys is booked tomorrow night. Go figure. Our Valentine’s date will happen on February 21. It might be a little anticlimactic, but at least we get to go to the grocery nine more times between now and then. Happy Valentine’s Day ya’ll. Good marriages and relationships are forged in the everyday events anyway. Aly and I love each other, and we love our kids, just like God loves us. Always, and forever. No matter what the calendar says. 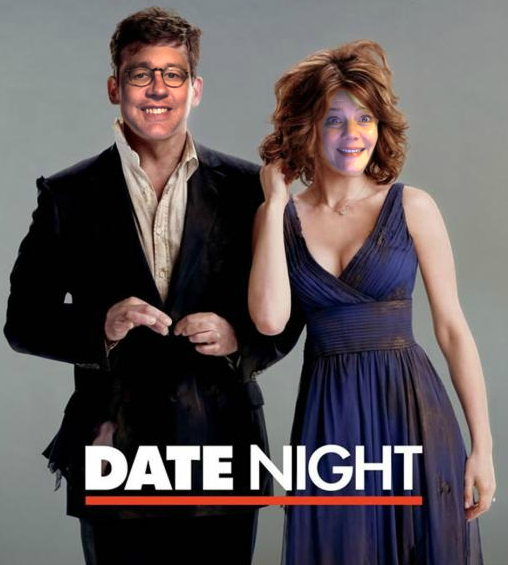 This entry was posted in The Dates and tagged box of candy, Date Night, Grocery, noah weather radio, tortilla chips, Valentine's Day by alykev. Bookmark the permalink. We miss you, your precious family, your amazing wit and wisdom, and would LOVE to hear from y’all. Well right back atcha. I miss ya’ll too…not a week goes by, really. Oh shoot! It’s Valentines day! Just joking…kinda. I was in the Walmarts last night at 11:00 doing my (stupid) valentines duty to not just one woman, but the 5 women in my life. I love making Katie and the girls feel special…but I really despise this holiday. Probably because most men are really bad at it and very few women actually get any satisfaction out of it. The best men can do is get a passing grade for the expectations women have (not really a “win”), and the more likely outcome is disappointment on some level. I know, I know. I am a real downer. But I am right. Valentines day is a looser of a holiday for everyone. If we can just keep our heads down through this day and make our wives and daughters feel special throughout the year we will make it for another spin around the sun to the next “V day”. “the Walmarts.” That’s where you went wrong. I so look forward to your posts….they are so true and so funny! No basketball, baseball, soccer, dance, etc tonight, and no transporting of our children anywhere, and that makes for a Happy Valentine’s!! I will be hitting Publix though, as I have no idea what I will be preparing for OUR (wife, husband & children) special dinner!!!! Enjoy your celebration on the 21st. We will be at Elliott’s very important play-off basketball game, so we will not be running into you guys at that fancy restaurant! :) Our romantic evening will include horseback riding lessons, science fair paper writing, and hoping to get to sleep at a decent hour. Sounds hot, right? Maybe we can squeeze in the new episode of Downton Abbey that we Still haven’t had time to watch. Downton Abbey will be a great climax to your hectic day. And its a two hour climax…I mean episode. Our valantines day too will be filled with appointments, carpools and transports of everything kid related. . I did manage to pick up A gift to show my love for Charley though… A bag of gummy bears. Nothing says romance like gummy bears. Alyson says I look handsome when I am picking Gummi bear detritus from my teeth. Great post, Kevin and so painfully true. I am cooking a real whole chicken for dinner, not a frozen pizza as usual. Ahhh the real whole chicken…the ancient Mayans considered the real whole chicken a symbol of fertility and devotion. The contemporary Mayans just see it as an economical dinner option. I see you were spreading your wealth yesterday, as I saw you at the Pig! I wanted to see how the riff raff markets their valentines candy. And, it is closer to Crayton. So funny! Our Valentine’s evening will be spent running kids too and from gymnastics and rugby. Throw in a lacrosse meeting to make it crazier and we will all be descending upon home between 9 and 9:30. Apparently sports teams and coaches do not celebrate Valentine’s Day so I guess we won’t either. This epitomizes my 7 weeks of marriage, Barker. Geez!!! I think ya’ll look good on the outside!! I want to hear Alyson’s perspective! all right already…be patient will ya…she’s at the grocery store.